I imagine that just about everyone who’s been fortunate enough to experience Urasawa considers it Los Angeles’ best sushi. However, the task of crowning a second-best is much more difficult, leading to much debate amongst the city’s sushi snobs. Being that I’ve yet to make it to Urasawa, I figured I’d have an easier (and less expensive) time navigating through the “best of the rest”, which is why I found myself in an aged Vons parking lot on National blvd. in search of Sushi Zo. Before detailing the extensive meal featuring over thirty different varieties of fish, there’s a few things worth mentioning about Sushi Zo. 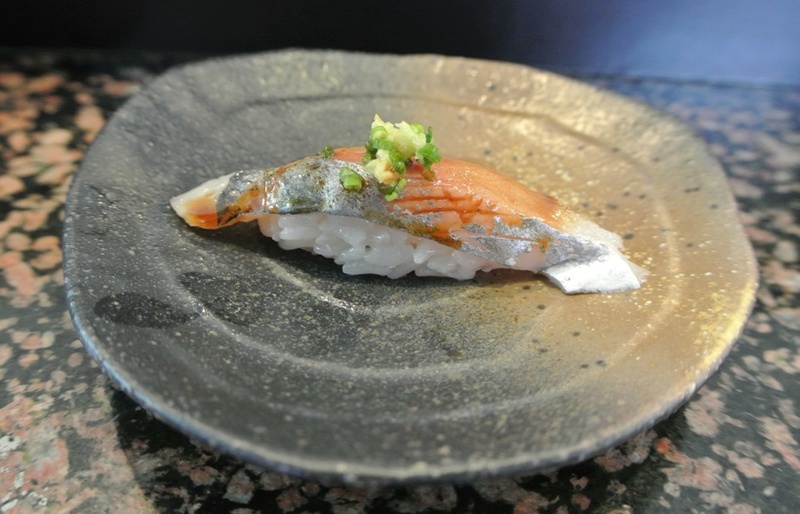 For starters, the sushi bar is omakase only, so naturally you’re not going to find any deep-fried rolls or fusion sauces. 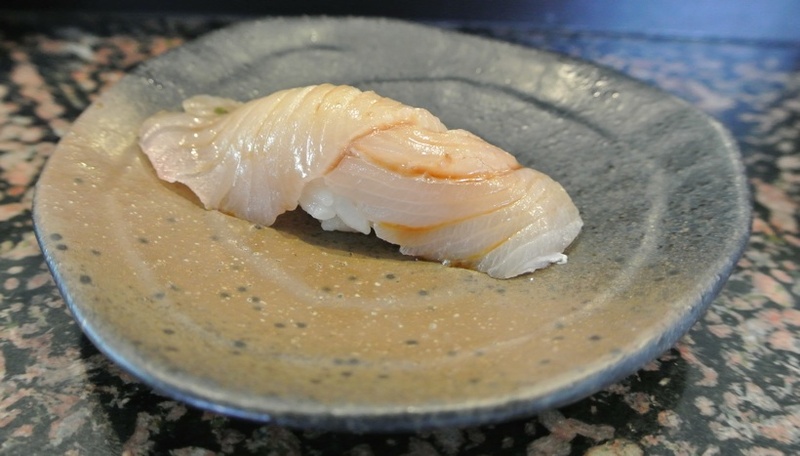 Chef and owner Keizo Seki makes his own shoyu in-house, which he and his team apply to the sushi before serving, lest any of their prized fish ends up soaking in a pool of soy sauce. 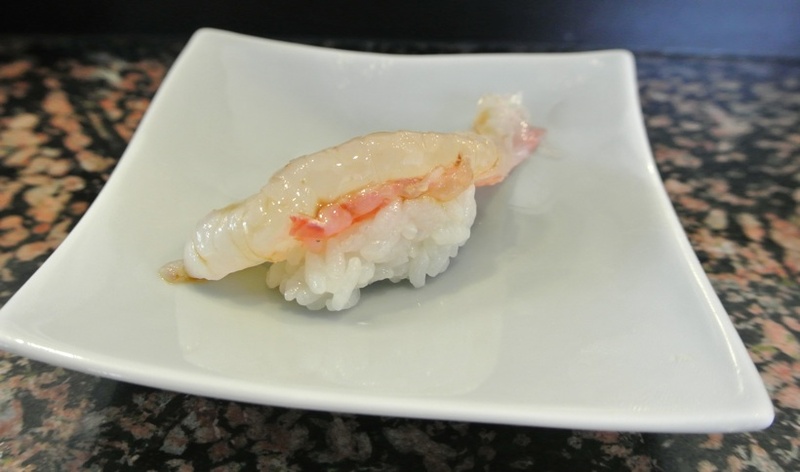 The last important note is the size of the nigiri, considerably smaller than what you’d find at most sushi bars. 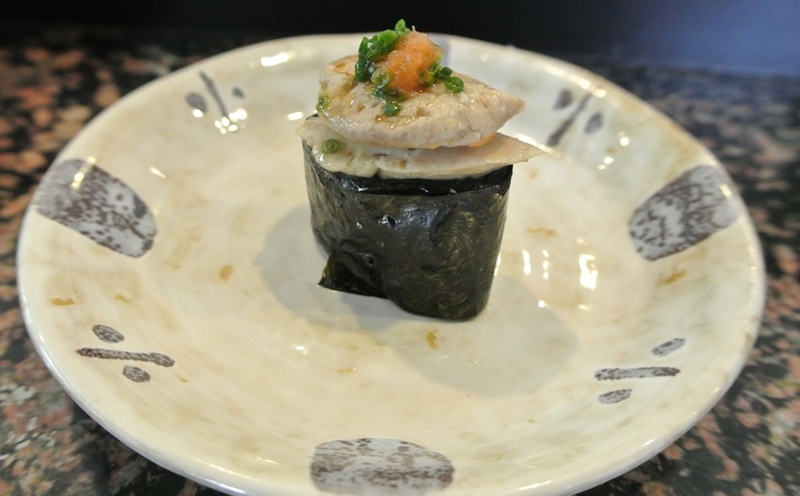 However, as you’ll see below, the small portions work to the customer’s benefit enabling them to try a wider selection of Sushi Zo’s expansive selection of fish. 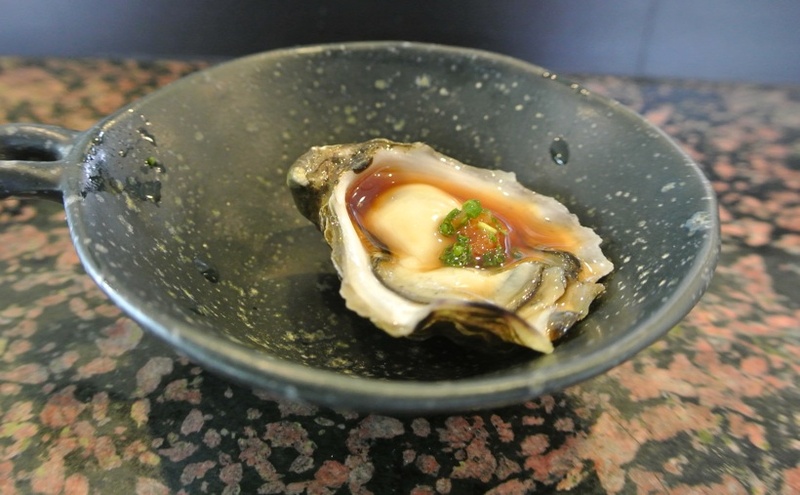 Omakase began with a single Kumamoto oyster from Washington, dressed in ponzu, grated daikon and scallions that all served as a compliment to the oyster’s natural brininess. A very crisp and refreshing first bite. 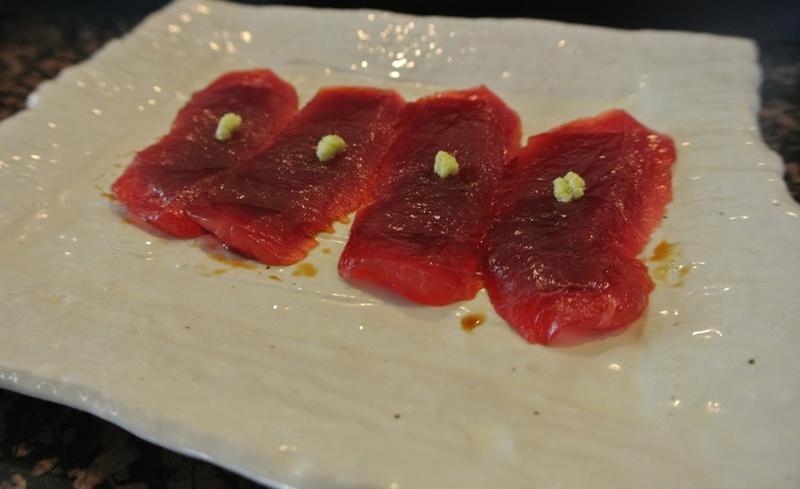 Sashimi consisted of a pretty straight-forward presentation of bluefin tuna. The tuna was brushed with Sushi Zo’s house made soy sauce which added a marinade-like richness of flavor, and topped with a bit of wasabi for heat. 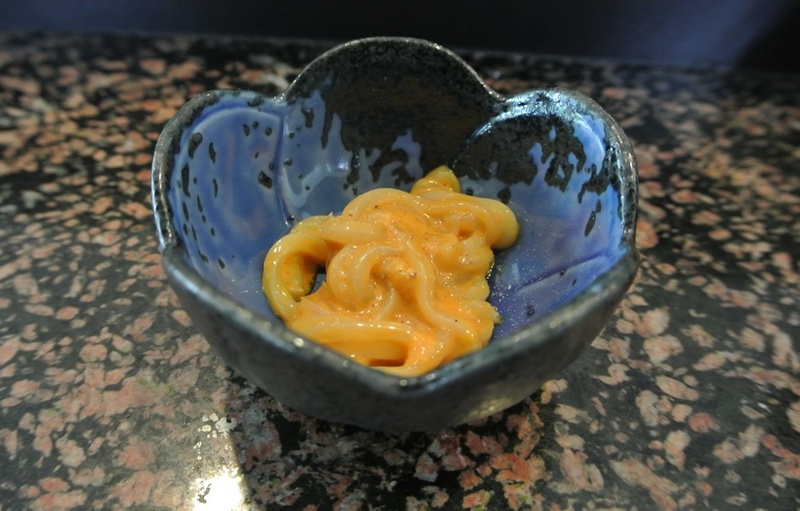 A tiny bowl of squid “noodles” arrived next, coated in a velvety uni “sauce” that was both sweet and full of ocean essence. I easily could’ve eaten two or three more servings, it was that good. 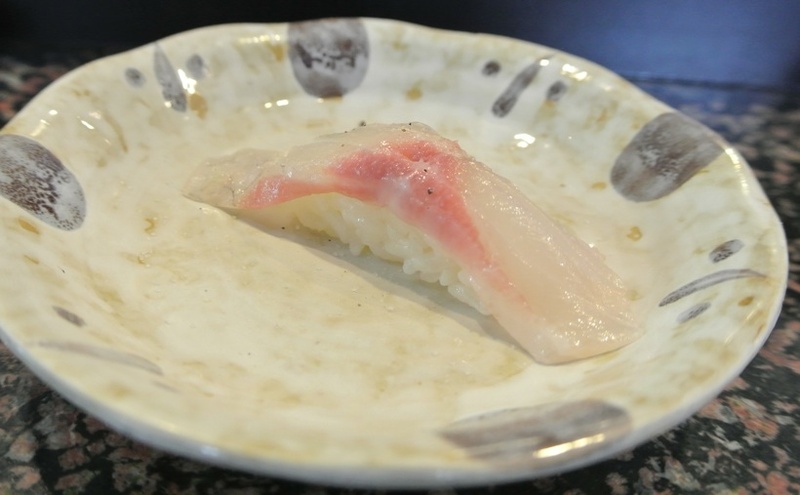 The relatively mild-tasting flatfish was heightened here by the addition of lemon and salt. Albacore from Canada was up next, a lot softer in texture than any other albacore I’ve eaten. The flavor of the fish wasn’t as pronounced either, but had a subtle sweetness that was brought out by the ponzu sauce. 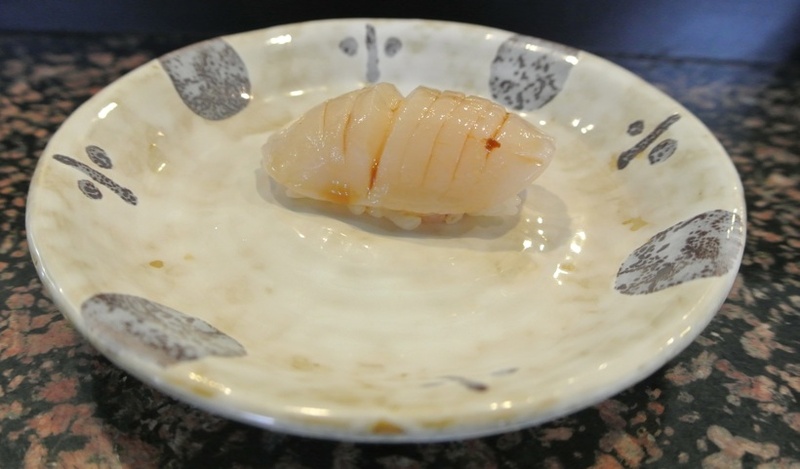 Scallop came next, incredibly fresh and sweet with just a bit of soy brushed on top. One of the best preparations of hotate that I’ve had. 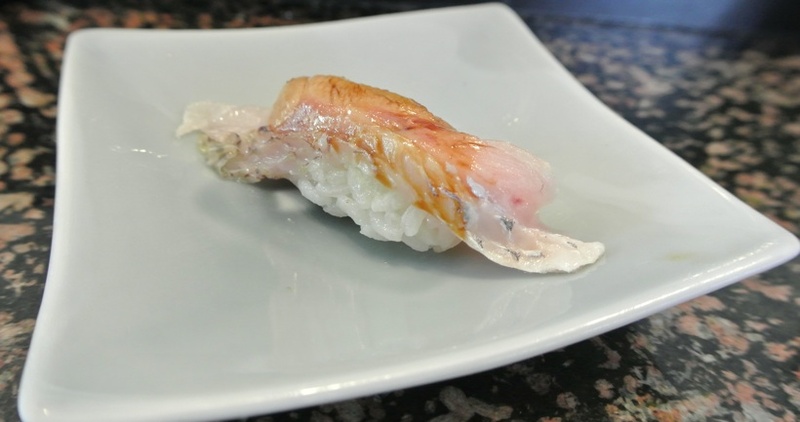 Aji was spot on, displaying a characteristic fishy taste tempered by the application of a special nigiri sauce (different, from what I understand, than the housemade soy and ponzu) and some grated ginger and scallion on top. Toro was a bit of a letdown. Granted it was good toro, but I was expecting a little bit more marbling and that trademark toro oiliness. 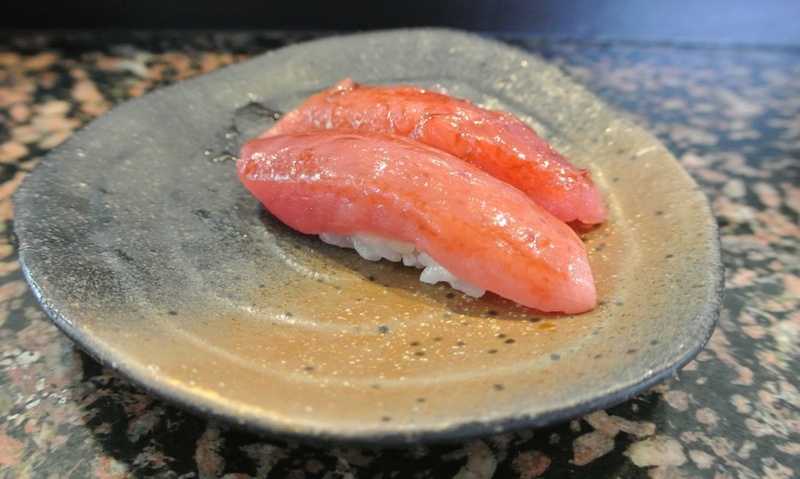 This was the only nigiri served in a pair, I think an acknowledgement of it being such a fan favorite. 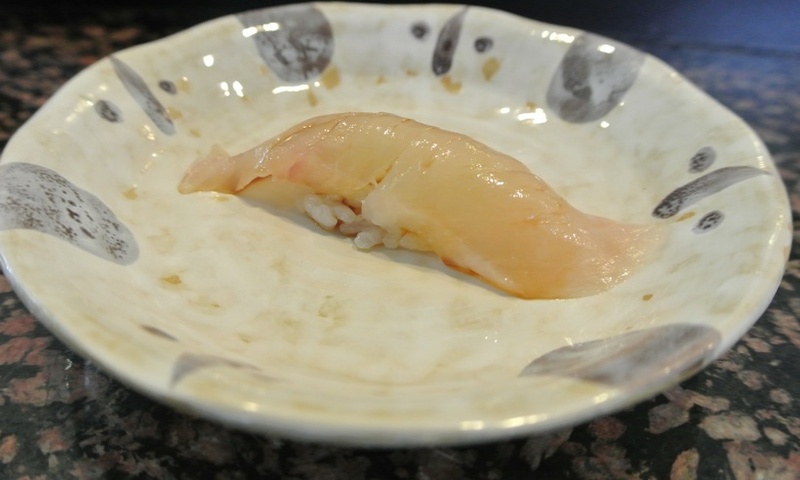 Next up was yellowtail, soy sauce already applied, featuring a less robust flavor than I was anticipating. Good, but not particularly remarkable. I don’t think I had ever had this type of snapper previously, but it was certainly a delicious example of the fish. Brushed with shoyu, it was very sleek in texture, with the bit of skin left on adding a nice counterpoint to the soft flesh. I loved the yuzu kosho here, its spice really taking center-stage. 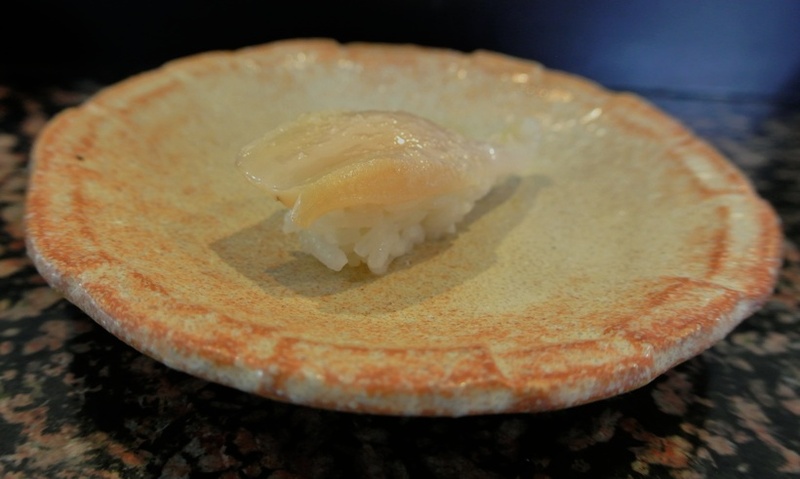 The amberjack had a somewhat firm texture, reminding me a bit of the scallop earlier in the meal. 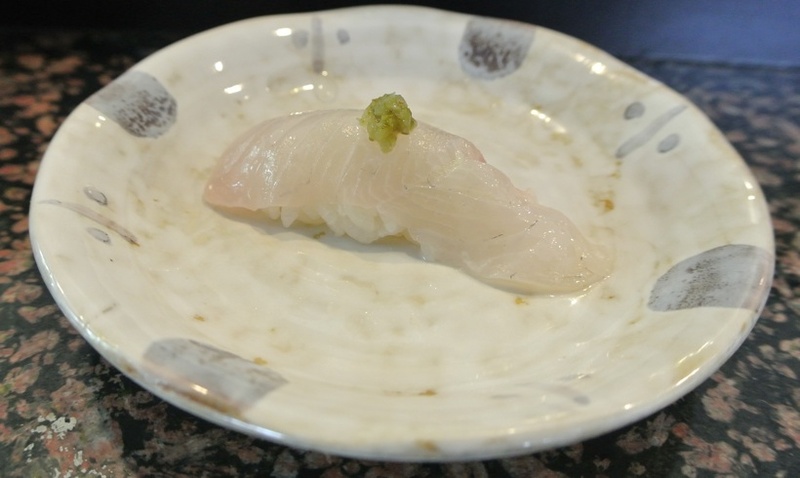 The very clean-tasting Pompano came next, elevated with a garnish of shishito. The thinly-sliced peppers took on an almost-caramelized quality, imparting a smoky-spice and bit of oil to the fish. 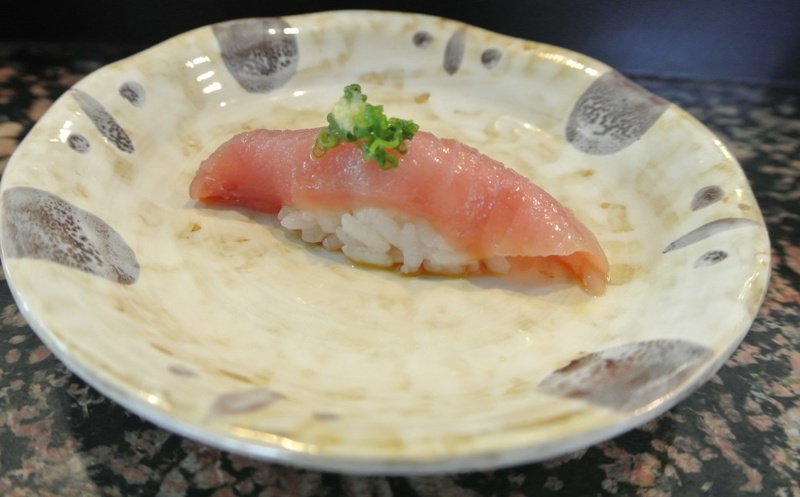 I’ve never had skipjack of this quality before, the tuna displaying a distinct softness and much more interesting flavor than the bluefin or even the toro. 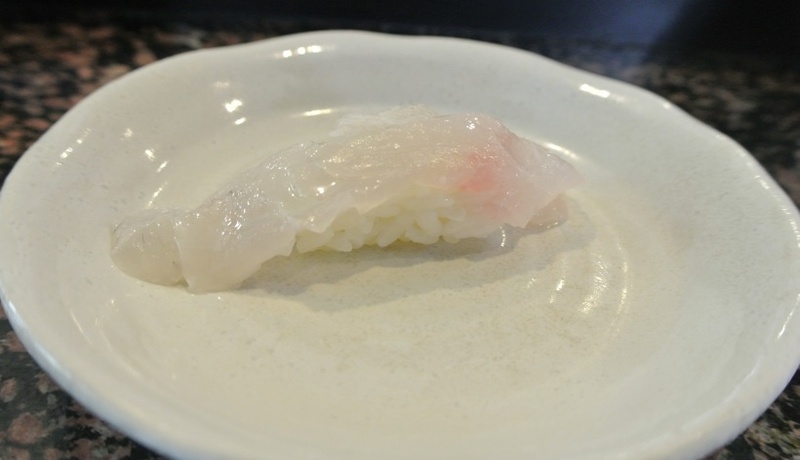 Another relatively mild-flavored fish, sea perch was clean and refreshing, with a touch of soy for balance. 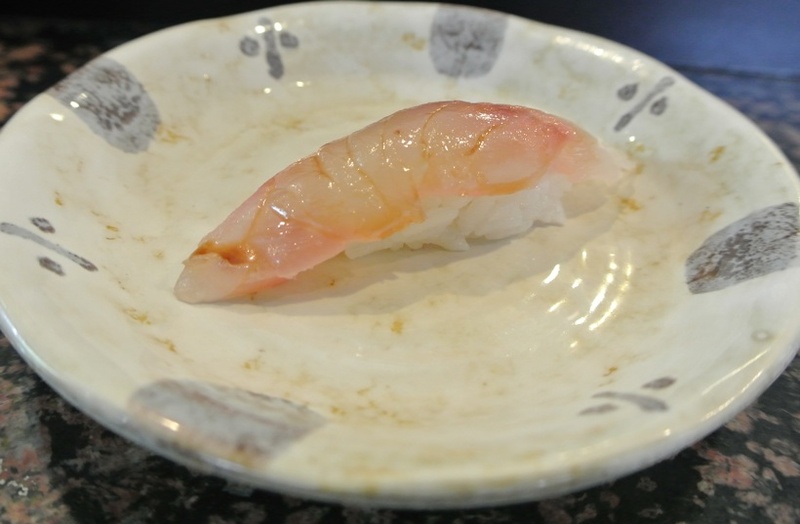 Amaebi displayed a creamy, snappy texture along with an inherent ocean quality to it. 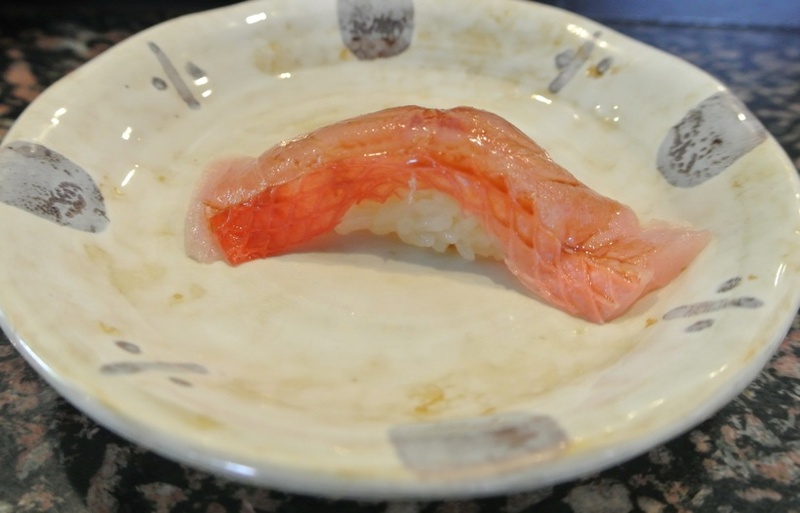 Interestingly, it was the first time I had been served sweet shrimp sans tail (there’s something particularly satisfying to me about squeezing out that last little hidden piece of tail meat), and perhaps also the first time I wasn’t offered the head, either fried or in a soup. Monkfish liver has definitely grown on me recently (ironically, this seems to have occurred around the same time the foie ban was handed down), but this was by far the best preparation I’ve had to date. It was served warm (perhaps briefly steamed prior to serving) which really brought out the the full depth of flavor. 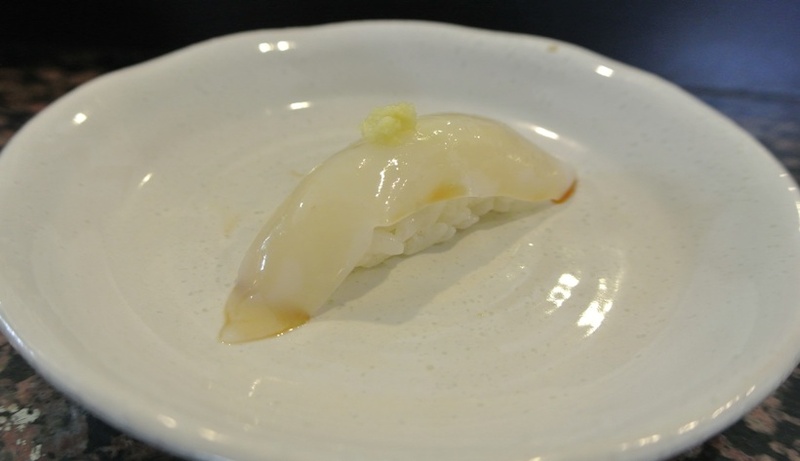 Mirugai can sometimes be hit-or-miss, the keys being freshness and how it’s cut, but the version here featured a characteristic bite to it, with a very clean taste and a lingering ocean-y finish. 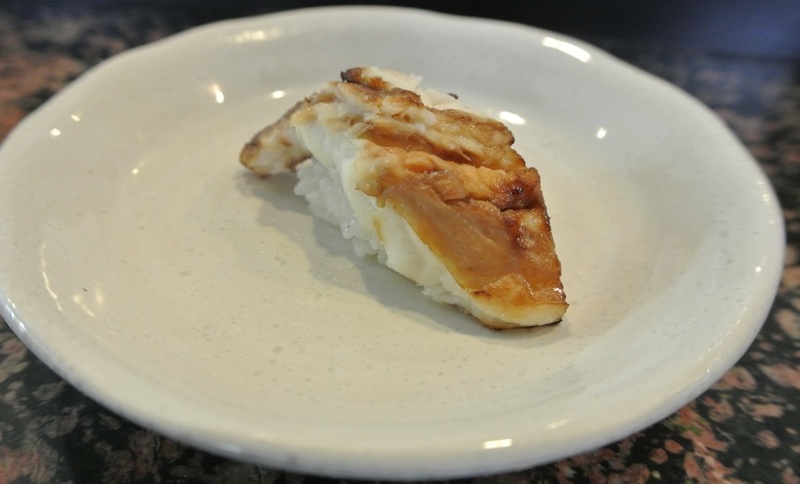 Here we had a very soft-fleshed striped jack, it’s underlying sweetness brought to the forefront by a splash of soy sauce. 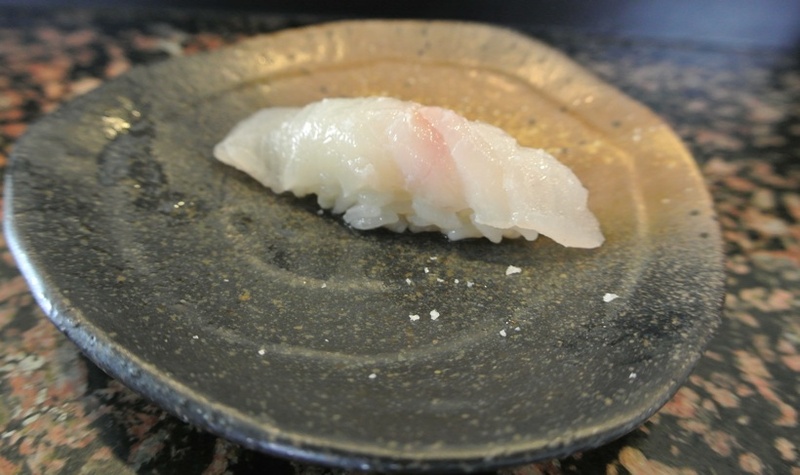 The second of three snappers presented, the kurodai was sprinkled with truffle salt, lending an expected richness to the relatively lean fish. Yet another first for me was grunt, a bottom-dwelling fish named for the “grunt” sound it makes when in distress. Its flavor wasn’t very pronounced, but the liberal application of soy was appreciated. I was anticipating this Japanese sardine to have a similar flavor composition as kohada, but it had nowhere near the same degree of fishiness. Instead, it was meaty with the silvery bit of skin lending a subtle sardine taste. The typically ocean-like taste of the orange clam was a bit subdued here by the addition of truffle salt. The clam itself was quite tender, just chewy enough to affirm its bivalve classification. 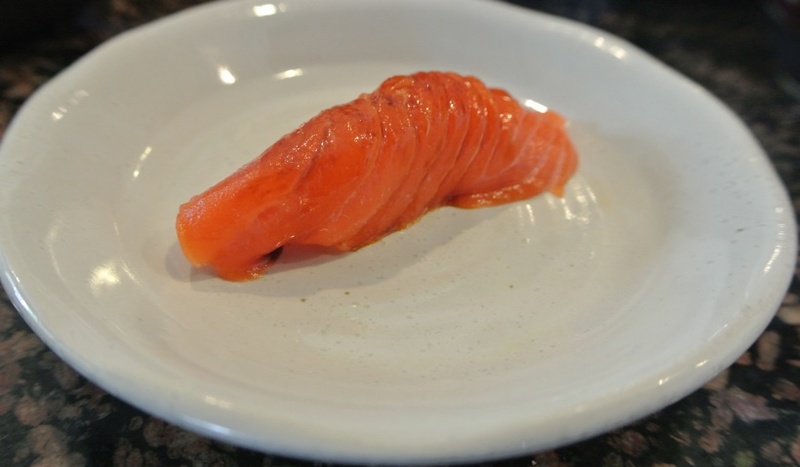 Salmon was extremely fresh with a vibrant orange color. One of the better examples I’ve had in recent memory. The last of the trio of snappers came topped with a squeeze of lemon and salt, adding a refreshing citrus tang to the moderate-tasting fish. I’m not sure exactly what varietal of squid this was, but I do know that it was unlike your run-of-the-mill ika. 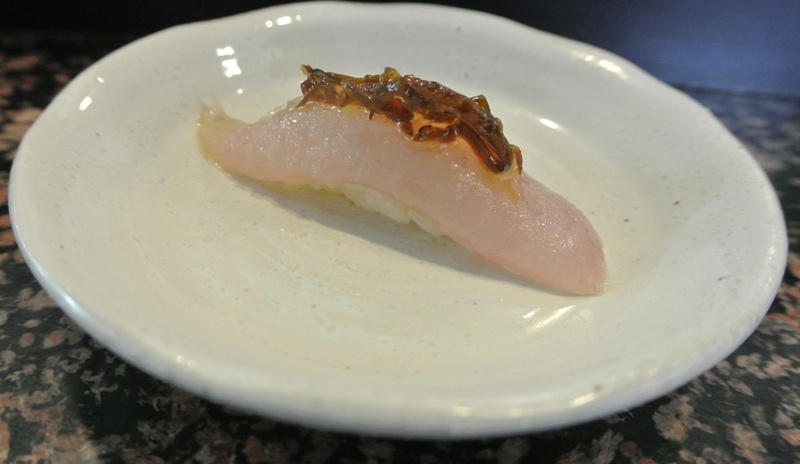 It was incredibly tender with a noted sweetness that was countered by a bit of ginger on top of the fish. 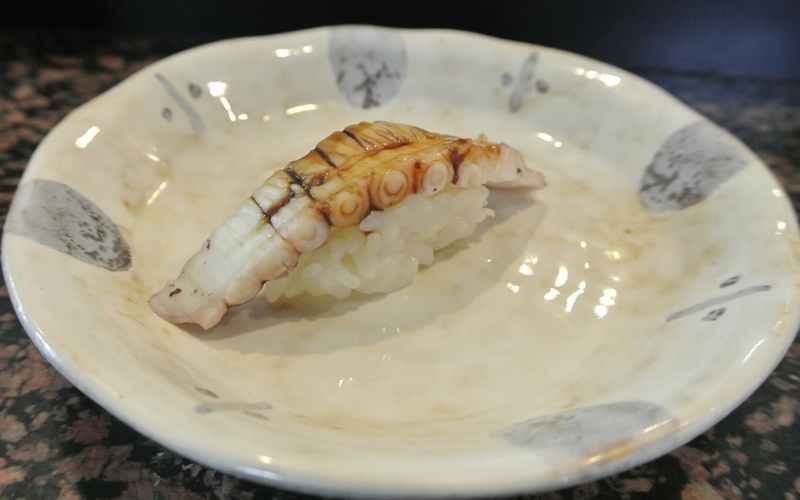 I’ve never been very fond of most octopus found at sushi bars, especially if nothing’s been done to tenderize it or enhance its flavors. 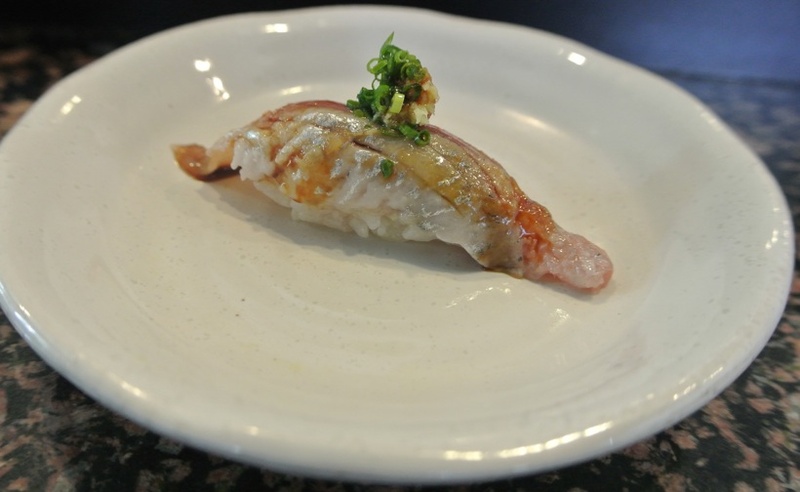 Here, though, was one of the meal’s highlights, seared tako that took on an almost eel-like characteristic. Simply divine. A duo of roes was presented next, a contrast of “eggs” so to speak. 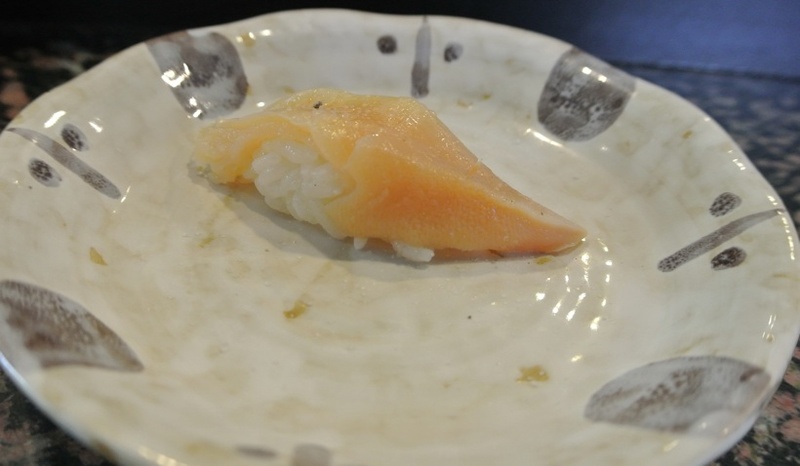 The ikura was noticeable less salty than usual, perhaps a result of some type of marinade prior to serving. Of course, they still displayed the expected “burst” upon chewing. 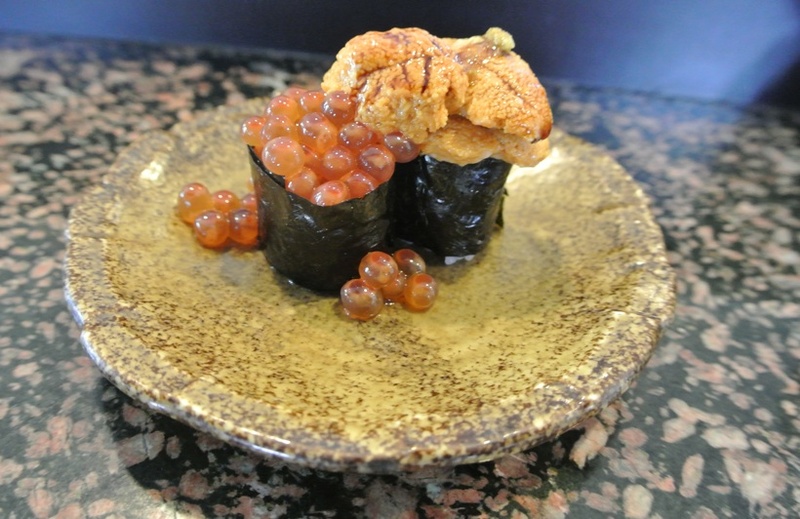 The uni was delicious, cool and creamy, a welcome complement to the saline-nature of the salmon roe. Anago marked the end of the nigiri section of the meal, and it was a fitting closer. It was without a doubt the purist display of sea eel that I’ve come across, allowing the meaty texture and natural flavors shine. 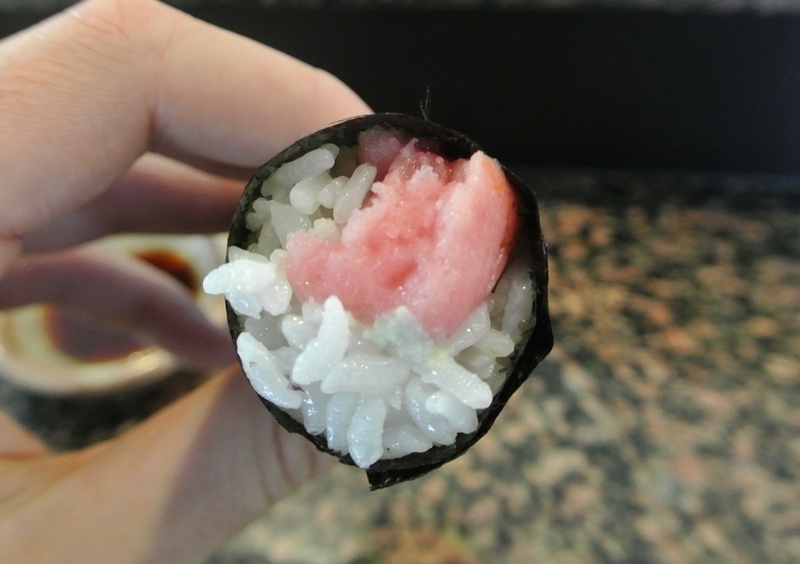 Unfortunately, the first hand roll up left a lot to be desired. 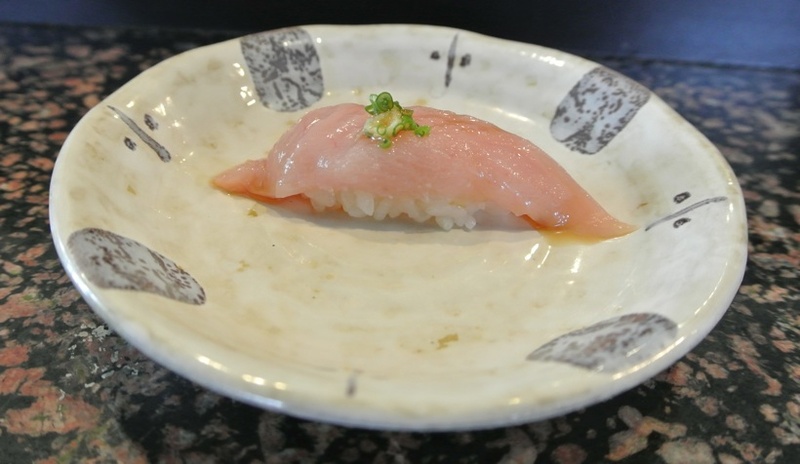 The toro itself was chopped so finely that it was near-mush, resulting in the rice becoming somewhat of a focal point. The blue crab hand roll, however, was flawless. 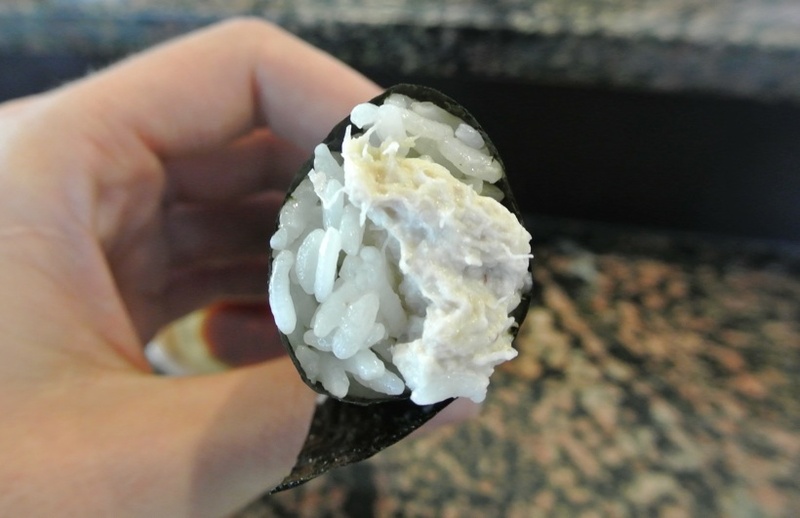 The sweet, creamy crab meat accentuated by the crunch of the nori and warm grains of rice. Without question, this was one of the most impressive sushi meals I’ve ever had. The precision and attention to detail was remarkable, from instructions on whether or not to use soy sauce for each piece to the re-filling of drinks and clearing of plates, the entire operation was fluid and on the same page. The sushi itself was as good as I’ve had at any other well-regarded restaurant, but what really put Sushi Zo over the edge was their selection of some of the more exotic varieties of fish that you just don’t find anywhere else. Expensive? Yes, but if you appreciate great sushi then it’s really a small price to pay for the quality of the experience.